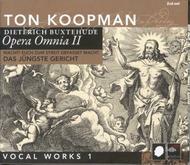 In this second volume of the Opera Omnia of Dieterich Buxtehude, Ton Koopman gives us his new reconstruction of Buxtehude�s only surviving Abendmusik. This oratorio, also called �Das Jungste Gericht�, had survived as an anonymous work in an incomplete set of parts in the Uppsala University Library. As the style is similar to Buxtehude�s lost Abendmusiker, this oratorio is almost certainly from his hand. Dieterich Buxtehude was a German-Danish organist and a highly regarded composer of the baroque period. His organ works comprise a central part of the standard organ repertoire and are frequently performed at recitals and church services. He wrote in a wide variety of vocal and instrumental idioms, and his style strongly influenced many composers, including Johann Sebastian Bach. Organist at the Marienkirche in L�beck for most of his life, Buxtehude is considered today to be the leading German composer in the time between Sch�tz and Bach. Ton Koopman studied organ (Simon C. Jansen), harpsichord (Gustav Leonhardt) and musicology in Amsterdam and was awarded the Prix d�Excellence for both instruments. As an organist he has performed on the most prestigious historical instruments of Europe, and as a harpsichord player and conductor of his Amsterdam Baroque Orchestra (founded 1979) & Choir (1993) he has been a regular guest at venues which include the Concertgebouw in Amsterdam, the Theatre des Champs-Elys�es in Paris, the Philharmonie in Munich, the Alte Oper in Frankfurt, the Lincoln Center in New York, and leading concert halls in Vienna, London, Berlin, Brussels, Sydney, Melbourne, Madrid, Rome, Salzburg, Tokyo and Osaka.